Here are some exciting updates! Rehearsals are well under way. The students are working really hard! Backdrop designs are proceeding, and props and sets are starting to emerge. This is very exciting but we still need your help! Regarding set and props, we are looking for several items on the list below. I would like to take this time to reach out into the school community to see if anyone might have anyone of these items they would be willing to share, lend or give to this production. - Old wooden wagon with at least one wheel that can be removed and put back on. - ANY EXTRA building materials you would like to donate are welcome! If a cast or crew member is interested in ordering a t-shirt they can do so by coming to rehearsal and I will put them on the list. If you are a supporter of the show you are also welcome to order a t-shirt too! T-shirts are only $10.00 a shirt. When the shirts arrive I will accept payments, which will go into our Student Activities Account. Check out our t-shirt design below! Please contact me with any questions or if you just want to help out! If you haven’t stopped by yet, there is still time to see the artwork by Mohawk students on display at the Annual Teen Art Exhibit at Artspace Gallery in Greenfield. The exhibit showcases students from all over Franklin County and runs from January 13 through February 14, 2014. The gallery hours are Monday - Friday, 1-6 and Saturday, February 8 from 11-3. 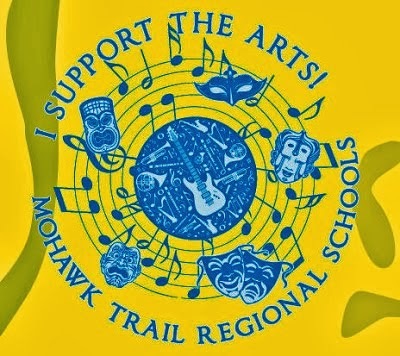 The following Mohawk students have art on display: Brianna Gray, Sara Paige, Josh Hutchins, Asia Whitaker, Heidi Phelps, Sequoia LeBeau, Cailin Duncan, and Samantha Cairns. Art teacher Mary Jane Johnson coordinates Mohawk’s participation in this local art exhibit each year.